4. CWGC headstone of Sub-Lt. R.M. Aitken, R.N. Wigton is a small market town situated in north-west Cumbria (previously Cumberland) about 10 miles (c. 16 kms.) south-west of the city of Carlisle. The town received its market charter in 1262. The present church building of St Mary's Parish Church (Church of England) mainly dates from 1788 and was built on the site of a previous church dating back to at least the 12th Century. Among the notable people born and brought up in the Wigton area are the painter and illustrator Robert Smirke, R.A. (1752 - 1845), the scientist and Nobel Prize recipient for Physics Sir William H. Bragg (1862 - 1942) and the broadcaster and writer Lord Melvyn Bragg, F.R.S. (b. 1939). Wigton's municipal cemetery is located on Station Hill on the outskirts of the town. The first burials were in 1856 with two mortuary chapels originally for the Established church and Non-conformists (one of which can be seen in Photograph No. 1 above]. Close to the entrance of the cemetery is Wigton's war memorial [Photograph No. 1]. 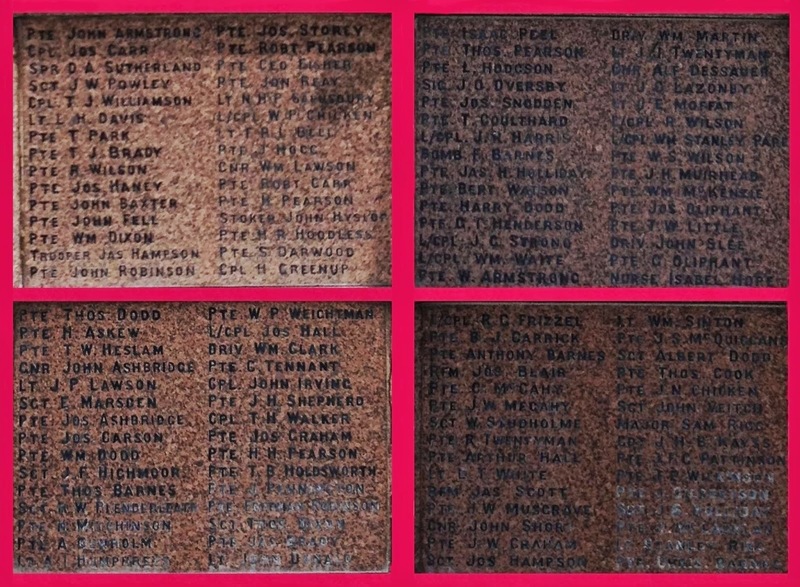 Originally constructed after the First World War the names of the people of Wigton who died that war can be found engraved on four granite panels around the base of the memorial. The four panels with the WW1 names can be seen in Photograph No. 2. This memorial also commemorates those from the Wigton who died in the Second World War [Photograph No. 3]. "This monument commemorates those who, at the call of king and country, left all that was dear to them, endured hardness, faced danger, and finally passed out of the sight of men by the path of duty and self sacrifice, giving up their own lives that others might live in freedom. Let those who come after see to it that their name is not forgotten." "Also those who laid down their lives in the Second Great War 1939 - 1945"
Thomas Grainger Jefferson , R.A.F.V.R. According to the additional information on the C.W.G.C. website Aircraftman T.G. Jefferson's next of kin (his mother and step-father) lived at Oulton a village just outside Wigton. Oulton has been part of Woodside parish since 1934 rather than the Wigton Town Council area. "He trod the the Golden paths of youth, then left the world and youth behind." Grave Reference: Sec. P.2. Ward 2. Grave 53. Son of Albert E. Aitken and Marjory Mallory Aitken, of Edmonton, Alberta, Canada. This article is dedicated to the Wigtonians who died in the two World Wars. "They gave their all so that others could be free." A 21st Century Remembrance for Wigton, Cumbria .